For other uses, see Armida (disambiguation). For the American actress, see Armida (actress). For the opera, see Armida (Rossini). For the minor planet, see 514 Armida. Armida by Jacques Blanchard, Museum of Fine Arts of Rennes. Armida is a fictional character created by the Italian late Renaissance poet Torquato Tasso. She is a Saracen sorceress. In Tasso's epic Jerusalem Delivered (Italian: Gerusalemme liberata), Rinaldo is a fierce and determined warrior who is also honorable and handsome. Armida has been sent to stop the Christians from completing their mission and is about to murder the sleeping soldier, but instead she falls in love. She creates an enchanted garden where she holds him a lovesick prisoner. Eventually Charles and Ubaldo, two of his fellow Crusaders, find him and hold a shield to his face, so he can see his image and remember who he is. Rinaldo barely can resist Armida’s pleadings, but his comrades insist that he return to his Christian duties. At the close of the poem, when the pagans have lost the final battle, Rinaldo, remembering his promise to be her champion still, prevents her from giving way to her suicidal impulses and offers to restore her to her lost throne. She gives in at this, and like the other Saracen warrior woman, Clorinda, earlier in the piece, becomes a Christian and his “handmaid”. Many painters and composers were inspired by Tasso's tale. The works that resulted often added or subtracted an element; Tasso himself continued to edit the story for years. In some versions, Armida is converted to Christianity, in others, she rages and destroys her own enchanted garden. She occupies a place in the literature of abandoned women such as the tragic Dido, who committed suicide, and the evil Circe, whom Odysseus abandoned to complete his voyage, but she is considered by many to be more human, and thus more compelling and sympathetic, than either of them. 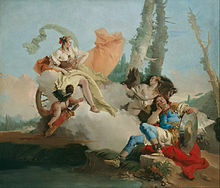 Rinaldo Enchanted by Armida by Giovanni Battista Tiepolo. Rinaldo and Armida, by Willem van Mieris (1709). On May 1, 2010, Rossini's Armida was performed and broadcast live to theaters around the world in the series MetLive in HD. Johannes Brahms composed a cantata entitled Rinaldo based on the story. Armida. Choreography by Jules Perrot. Music by Cesare Pugni. First performed by the Imperial Ballet at the Imperial Bolshoi Kamenny Theatre, St. Petersburg on 20 November [O.S. 8 November] 1855. Le Pavillon d'Armide. Choreography by Mikhail Fokine. Music by Nikolai Tcherepnin. First performed by the Imperial Ballet at the Imperial Mariinsky Theatre, St. Petersburg on 25 November [O.S. 12 November] 1907. Second premiere given by the Ballets Russes at the Théâtre du Châtelet, Paris on 19 May 1909. Rinaldo and Armida. Choreography by Frederick Ashton. Music by Malcolm Arnold. First performed by the Sadler's Wells Ballet at the Royal Opera House, Covent Garden, London on 6 January 1955. Wikimedia Commons has media related to Armida.